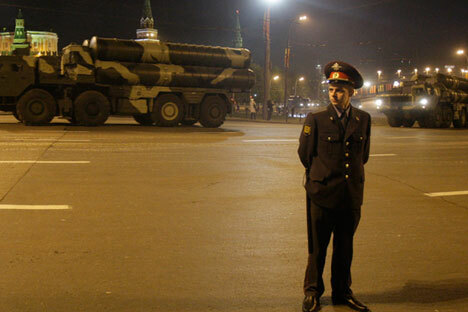 Russian S-300 missile system during a rehearsal for the Victory Day military parade in Moscow, 2009. Russia has settled all issues surrounding the delivery of S-300 air defense missile systems to Iran through lengthy and delicate negotiations, Russian Deputy Prime Minister Dmitry Rogozin said in an interview with the Rossiya-24 (VGTRK) news TV channel on Dec. 30. "We [earlier] refused to deliver this S-300 system, and Iran got agitated and made the decision on filing a sizeable and serious lawsuit against us. This lawsuit didn't really move ahead, and no deliveries were made. And now we have secured the settlement of this dispute through lengthy, complicated and delicate negotiations - as they say, the East is a delicate thing," Rogozin said. Rogozin had said earlier that Iran would withdraw its suit concerning S-300 deliveries against Russia in the near future, i.e. immediately after the first battalion of this system is shipped. He said "the unconditional withdrawal" of the suit was a precondition of this shipment. Russia and Iran had signed a contract for S-300 in 2007. After the UN Security Council imposed sanctions on Iran in 2010, Russia suspended the contract's implementation, even though these systems were not subject to the sanctions. In response, Iran filed a lawsuit against Russia with the International Court of Arbitration. After an international deal was concluded on the Iranian nuclear program in April 2015, the ban on the S-300 delivery to Iran was lifted.